Neil Shubin, the paleontologist and professor of anatomy who co-discovered Tiktaalik, the “fish with hands,” tells the story of our bodies as you've never heard it before. The basis for the PBS series. By examining fossils and DNA, he shows us that our hands actually resemble fish fins, our heads are organized like long-extinct jawless fish, and major parts of our genomes look and function like those of worms and bacteria. Your Inner Fish makes us look at ourselves and our world in an illuminating new light. This is science writing at its finest—enlightening, accessible and told with irresistible enthusiasm. Neil Shubin is the author of the best-selling Your Inner Fish, which was chosen by the National Academy of Sciences as the best book of the year in 2009. Trained at Columbia, Harvard, and the University of California at Berkeley, Shubin is associate dean of biological sciences at the University of Chicago. In 2011 he was elected to the National Academy of Sciences. "Cleverly weaving together adventures in paleontology with very accessible science, Neil Shubin reveals the many surprisingly deep connections between our anatomy and that of fish, reptiles, and other creatures. You will never look at your body in the same way again--examine, embrace, and exalt Your Inner Fish!" "If you thought paleontology was all about Jurassic Park, take a look at this eye-opening book. Shubin takes us back 375 million years, to a time when a strange fish-like creature swam (or crawled) in shallow streams. Come along on this thrilling paleontological journey and learn how living things--including you--got to be what they are." "The human story didn't start with the first bipeds; it began literally billions of years ago. 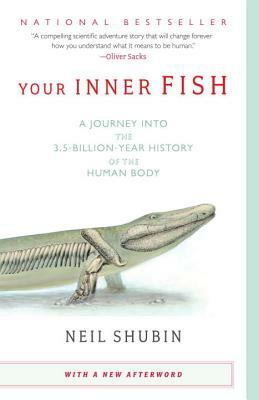 In this easy-reading volume, Shubin shows us how to discover that long and fascinating history in the structure of our own bodies while weaving in a charming account of his own scientific journey. This is the ideal book for anyone who wants to explore beyond the usual anthropocentric account of human origins."